The second-biggest city in the whole of South Africa after Johannesburg, Durban is only slightly larger than Cape Town in terms of overall population. Durban's endless sunshine and beautiful beachfront has seen a great increase in tourism levels in recent years, and is now amongst South Africa's most visited tourist destinations. Durban is home to Africa's busiest harbour and owes its immense popularity to its scenic location around Natal Bay, where the waters remain warm throughout the year. The Golden Mile next to the city's main beach features a host of entertainment, with seafood restaurants, nightspots, high-rise accommodation and modern shopping centres. Those wishing to swim in the inviting Indian Ocean can relax, safe in the knowledge that shark nets are in place. The Tourist Junction on Pine Street serves as Durban's tourist information centre and is housed within the city's former railway station, where it stocks a wide variety of maps and information on this part of South Africa. The 19th-century red-brick building is something of a tourist attraction in itself, since its roof is said to have been originally designed for snow-bound Toronto in Canada, but was mistakenly installed in subtropical Durban. A statue of Gandhi, who once caught a train here on his way to Johannesburg, stands at the entrance. 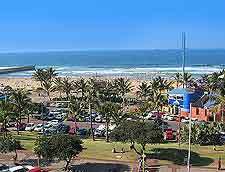 There is certainly much more to Durban that simply its stunning beaches and coastline, with tourists regularly flocking to a number of water parks to cool down. Always popular is the uShaka Marine World, which is now the city's number one amusement park and contains everything from an underground aquarium and dolphin shows, to exciting water slides and pools. Next door, uShaka Beach is a good place to try your hand at jet skiing or windsurfing. After hours, the Golden Mile waterfront really comes into its own and Durban tourists regularly frequent the Entertainment World complex and the Suncoast Casino. 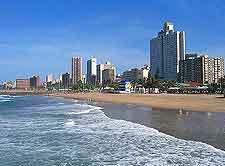 More information about Durban Tourist Attractions. There is no denying that Durban's modern-day appearance has been influenced by many different cultures, with elements of both Europe and Indian being clearly visible, along with a strong Zulu element. 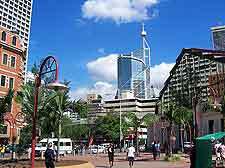 The Victoria Embankment is one of the most prominent streets in Durban and runs alongside the Bay of Natal, where it also goes by the name of the 'Esplanade' and is lined with places of interest. Smith Street is home to the City Hall and its majestic copper dome, while Grey Street in the Indian district is where you will find the Juma Musjid Mosque. 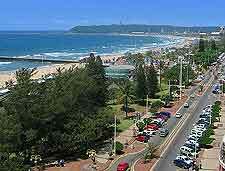 More information about Durban Landmarks and Monuments. Durban's bay has been used for shipping for more than 500 years, after first being thought to actually be a lagoon and not connected to the neighbouring Indian Ocean. Information about the city's seafaring history is clearly documented within the Natal Maritime Museum, which offers a very interesting way to spend a few hours. The City Hall is also home to a number of leading cultural attractions, such as the Natural Science Museum and also the Durban Art Gallery, the latter of which features an ever-changing collection of art works, numbering some 3,500 in total. 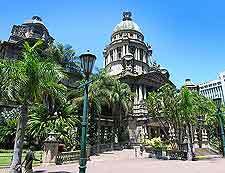 More information about Durban Museums and Durban Art Galleries. There are many attractions, nature reserves and beach resorts surrounding Durban and spread around the KwaZulu-Natal region, offering a choice of possible day trips. Tourists often enjoy making the effort to visit the Elephant Coast Wetlands Park or the Kranzkloof Nature Reserve, where South Africa's flora and fauna is especially concentrated. Surfers will likely favour an excursion to either Ballito or Margate, both of which are just a short drive from Durban and offer many typical seaside attractions, such as lifeguards, rock pools, coastal promenades and plenty of gift shops. 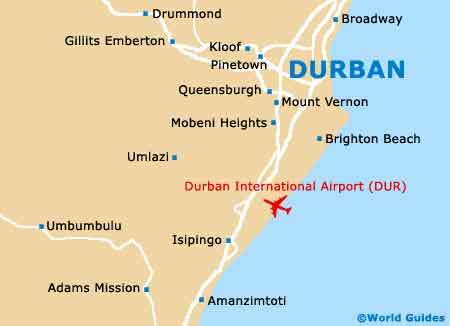 More information about Durban Attractions Nearby.